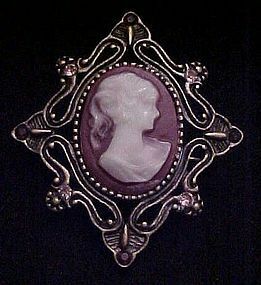 Pretty vintage cameo pin is not the real deal but is very pretty and will get lots of compliments. Measures2" x 1 3/4" and the antiqued gold tone setting is embellished on the points with tiny rhinestones. Nice condition. No makers name or mark. 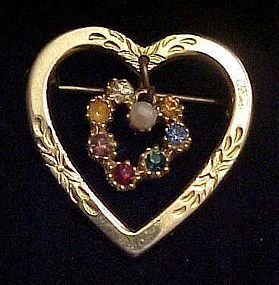 A pretty little pin perfect for your Valentine or just a nice sweetheart gift. Pretty gold tone heart with scrol decoration holds another heart that dangles inside with a series of multi colored prong set rhinestones. Measures 1 1/8" x 1 1/8". Very nice condition. No makers marks. 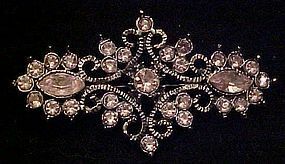 Pretty antique look rhinestne pin with champagne pink rhinestones set in an antiqued silvertone setting. 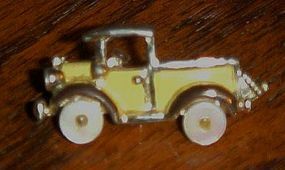 I believe this pin is newer but has a Victorian look. Excellent condition. Measures 2 11/4" long and is1 1/4" tall. Not signed. Here is a wonderful Victorian era pin set in a pewter color setting with lots of ornate work. 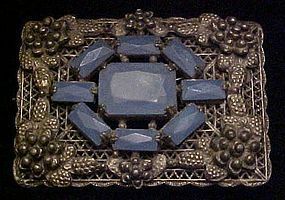 The stones are an opaque delphite blue with an emerald cut. Stones are all prong set and intact. Stones do show some wear but would probably buff up with polish. Backs to stones are all open. Pin back is crooked and could be straightened but still fastens well. It was probably used in a heavy coat fabric or cape. This large pin measures 1 3/4" x 2 3/8". Double Shot Glass! 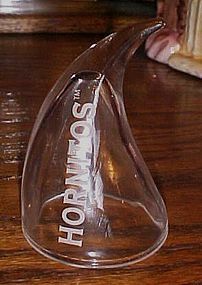 Collectible Sauza Hornitos Tequila Horns Up Devil Horn Double Shot Glass! Very nice CLEAR Double shot glass with intact white etched lettering, has no chips or cracks, and measures 3 1/2" tall... A great throwback to the original Mexican agave farmers/distillers that were without drinking glasses... They would drink from a hollowed out tip of a bull's horn, called a cuernito or caballito. 2 available, price is per glass. 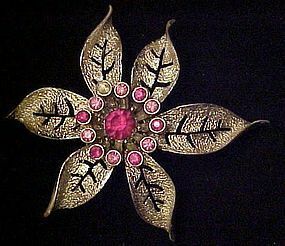 Beautiful Fashion flower pin made in the 1960's by Sarah Coventry. 2 3.4" diameter.Very attractive gold tone pin with 6 point flower shape with open veined petals and a center cluster of small hot pink chaton cut rhinestones surrounding a larger hot pink set. A dash of color combined with gleaming gold tone for year around fashion accents. Sarah coventry also made matching earrings to the "Fashion Flower" pin listed here. I do not have the earrings. 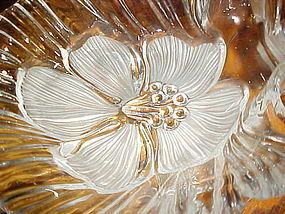 Pretty divided crystal dish with a large frosted flower in each section. Made by Mikasa Germany. It is in excellent condition with no wear and no defect or damage. It is missing only it's original box. It measures over 13" long and 7 1/2" wide and stands just over 3" tall. Vintage green canoe in Daisy & Button pattern. Early Fenton piece but it is unmarked because they used stickers on the earlier pieces. Wonderful condition with no damages. Measures 6" long, 2" wide, 2" high. Pretty solid glass paperweight with the gorgeous irridesence of white carnival glass. Ground polished bottom. Measures 2 1/4" tall and is about 3" long. Perfect condition. No sticker or signature. Ahh just a little kiss so you will remember Ferndale. 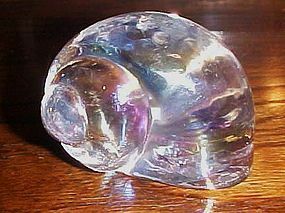 This clear hand blown hershey kiss measures just a shave over 2" tall and is a sweet little paperweight for your desk. Lightly etched into the glass is Ferndale,Ca. Perfect condition. 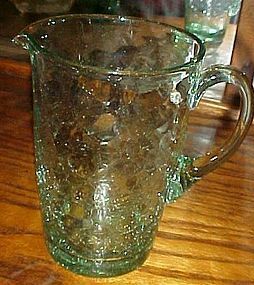 Hand blown lt green crackle glass water pitcher 6 3/4"
A great little hand blown water or juice pitcher probabbly holds a quart, Thick bottom and hand applied handle. Pretty coke bottle green crackle glass. Not sure who made this, Nice and heavy. Perfect condition too. Has the pontil scar on the bottom. THis little qt pitcher is great to use, and measures 6 3/4" tall. Gorgeous linited edition 1999 porcelain Christmas ornament by Lena Liu. Distributed by the Bradford Exchange. 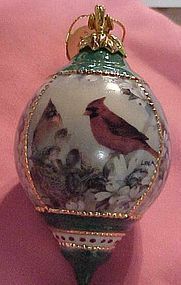 Vintage 1999 Limited Edition Morning Serenade bird ornament By Lena Liu. In original plastic with tag, Measures 5" tall. Never used! I have others from this series I will be listing. 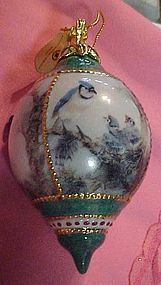 Gorgeous linited edition 1999 porcelain Christmas ornament by Lena Liu. Distributed by the Bradford Exchange. Vintage 1999 Limited Edition Lyrical Beginnings bird ornament By Lena Liu. In original plastic with tag, Measures 5" tall. Never used! I have others from this series I will be listing. Gorgeous limited edition 1999 porcelain Christmas ornament by Lena Liu. Distributed by the Bradford Exchange. 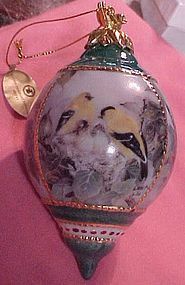 Vintage 1999 Limited Edition Morning Chorus bird ornament By Lena Liu. In original plastic with tag, Measures 5" tall. Never used! I have others from this series I will be listing. Indiana Harvest small marigold canister 7"
Lovely vintage 1970's small 7" canister with lid. Made of marigold color carnival glass with the pretty grapes, Harvest pattern. Perfect condition and has a beautiful rich colr. 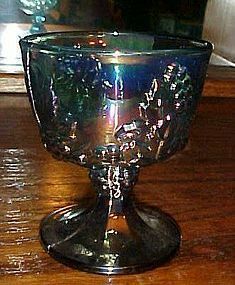 BEAUTIFUL VINTAGE BLUE CARNIVAL GLASS SUGAR BOWL! Traditional and much loved Indiana blue carnival in the Harvest Grape pattern. 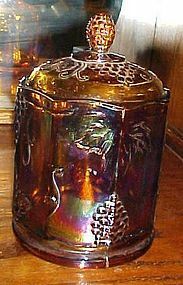 Stunning irridescent colors.... that makes Carnival Glass so collectible after all these years! 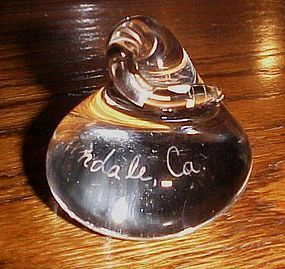 The sugar bowl measures 3 ¾” tall by 3 3/8” in diameter.. No chips, nicks or cracks. 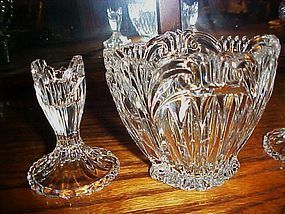 Some folks use these as sherbert dishes. Pretty contemporary flower bowl and matching candle holders. Made of pressed crystal with pattern that intensifies each spectrum of light that shines on it. Bowl measures 4" tall, and the matched candle holders are 3 3/4" tall. Pristine condition and would make a lovely gift. Not sure of pattern or maker. No box.